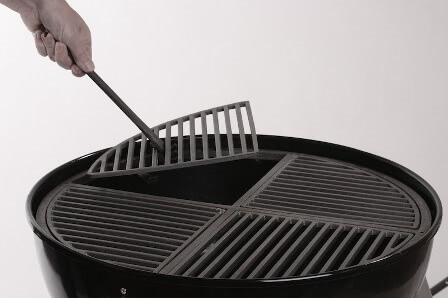 We offer a variety of grates for charcoal grills including kettle style charcoal grills. Rest assured that all of our grates are already seasoned providing a nice smooth, non stick grilling surface. Since our grates come in sections, they can also be individually removed making it convenient for adding coal or wood smoking chips. Because our grill grates are made of cast iron, you'll get a nice even heat that maintains and holds the temperature consistently. This means your food will cook evenly throughout. The materials used in your cooking surface are THE most important factors in how well your food cooks AND tastes when cooking outdoors. You don't want the outside of your food to cook too much faster than the inside. When this happens, you end up with dry, burnt food. Strong, Sturdy And Ready To Go! Before using the first time; just wipe the grate off with a soft damp cloth and it's ready to go. No seasoning required! For general maintenance after grilling, simply use a grill brush and brush it clean in a matter of seconds and give a quick spray of oil. With the right care, your grill should provide good tasting food and fond memories for years to come. It's recommended that you brush the grill while still hot carefully removing any excess food and then spray the surface with a little olive oil. Our modular style provides great space and flexibility should you want to add a griddle, a hotstone or a chickenseat. Are you grilling for a large crowd? No problem. You can actually cook an entire chicken, wings, steaks and pizza too - all at the same time. If You Like To Grill And You Like To Eat - Then You'll Love Our Grill Grates! We have the right grate size for your grill! Please select your Cast Iron Grate below: for 22.5", 18.5", 26.75" Weber and other compatible kettle grills and 14.5" Smokey Joes and Bodum Frykats.